During the huge bull, too many of us got too caught up in considering the implications of the first important reality. If stocks offer better returns, then investing in stocks gets you to retirement faster. That really is so and that really is important. But to make investing choices that will work for the long term, we need always to keep that other important reality in mind too: stocks are more volatile, and the negative implications are huge. Say that you begin investing in stocks at age 25 and experience good results for 25 years. At age 50, you have not only met your investing goals, you have exceeded them. You are sitting on top of the world. You’re thinking that you might be able to retire at age 60 or, if you get lucky, perhaps even earlier. Then stocks enter one of those dismal time-periods in which there are a long string of losses. One year, your portfolio is down 40 percent. Then you see two years of no growth and no losses. And then you see another 30 percent loss. And then a small gain. And then another big loss. By age 60, you are far behind where you expected to be at that age when you began investing 35 years earlier. Volatility kills. That’s the reality. Stocks really are a great asset class. But stocks are exceptionally volatile. If you don’t have a plan for dealing with volatility, you shouldn’t be invested in stocks at all. That’s my take. Stocks do not dish out negative results randomly. If you look at the historical stock-return data, you will see that stocks always perform at least acceptably (and usually much better than that) starting from times of low or moderate valuation levels. In contrast, stocks always dish out bone-crushing losses to those who invest heavily in them at times of insanely high prices (like those that applied from 1996 through 2008). My conclusion is — Smart investors lower their stock allocations when prices get too high. Do that, and you reduce the riskiness of stock investing by roughly 80 percent, according to the historical data. You get to enjoy most of the positives of stock investing while also making the risks associated with this asset class far more manageable. Another tip is — don’t count all the gains you obtain from stocks as real. The U.S. economy has for a long time been sufficiently productive to finance an annual increase in stock prices of about 6.5 percent real. In years when stock prices go up by that much, the gains really are yours to keep. 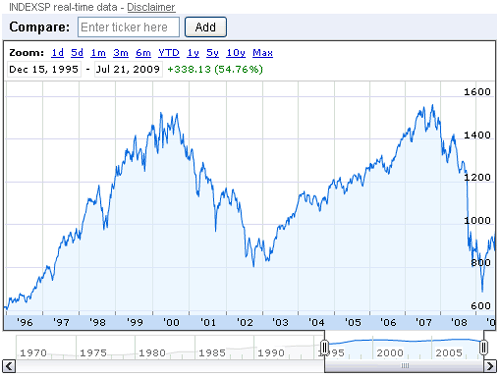 But in the 1990s there were years when stock prices went up by 20 percent or 25 percent or even 30 percent. Were those gains real too? Hardly. The absurd gains we saw during the insane bull market represented money being borrowed from the future. All that happened in 2008 is that stock investors paid some of the bill incurred during those years when we all pretended that gains of 20 percent or 30 percent were possible in an economy generating economic productivity strong enough to finance gains of 6.5 percent. If you counted those gains as real, you probably adopted a practice of spending more than you should have on cars and vacations and houses. Not good. That means that today you are suffering a double whammy. You have lost money in the stock crash. And you have also grown accustomed to a higher standard of living than was justified by your real portfolio gains of earlier years. Both aspects of the double whammy were caused by stock volatility. It’s volatility that causes excessive price increases, which encourages stock investors to adopt spending habits that cannot be sustained. And it’s volatility that causes the huge bull markets that inevitably are followed by huge bear markets. Volatility is a killer. That’s what it comes down to. I don’t think that you should become so concerned about volatility that you avoid investing in stocks. Do that and you are going to delay your retirement by many years or even decades. But I think we all need to focus more on the true nature of the risks associated with stock investing. Stocks are a devilish asset class. They provide great returns. But it is far harder than most realize for investors to hold onto those returns for the long run. Serious investors understand that volatility is not just a word. It is a true danger, one that can kill your hopes of financial freedom. Yes, invest in stocks. But no, don’t do so until you have developed the level of emotional maturity needed to look volatility in the eye and overcome it. Those big long-term returns are not handed out to all who one day bought some stocks. They are reserved for those willing to size up the risks and overcome them. Volatility is the killer. Don’t let it sneak up on you in the dark. Learn how it has destroyed millions of stock investors before you so that you can discover what you need to discover to make sure that you do not become one of them. Rob Bennett is author of the A Rich Life blog and co-creator of “The Retirement Risk Evaluator,” the only retirement calculator on the internet that adjusts the safe withdrawal rate for the valuation level that applies on the day the retirement begins. This is simply really well said. Too many of us are bemoaning the loss of home equity or retirement assets, that we knew were too good to be true. I only wish I had thought this through a few years earlier, so at least I could have curbed my spending. Great post!